Whooping cough, also known as pertussis, is a highly contagious disease caused by the bacterium, Bordetella pertussis and typically characterized by a severe hacking cough followed by a high-pitched intake of breath that sounds like "whoop." Worldwide, there are 30–50 million pertussis cases and about 300,000 deaths per year. Despite an effective vaccine and generally high coverage with this vaccine, pertussis is one of the leading causes of vaccine-preventable deaths worldwide. Most deaths occur in young infants who are either unvaccinated or incompletely vaccinated; three doses of the vaccine are necessary for complete protection against pertussis. Ninety percent of all cases occur in the developing world. Human creativity has addressed the need to develop a vaccine, but there remains the challenge of access to the vaccine for many individuals worldwide. Whooping cough or pertussis is caused by Bordetella pertussis, a Gram-negative, aerobic coccobacillus. Unlike B. bronchiseptica, B. pertussis is non-motile. There does not appear to be a zoonotic reservoir for B. pertussis—humans are its only host. A similar disease to whooping cough, but milder, is caused B. parapertussis (Finger and von Koenig 1996). The most severe symptoms of whooping cough are caused by B. pertussis attaching itself to those respiratory tract cells with cilia (Carson-Dewitt 2006). B. pertussis interferes with the normal function of the cilia (hair-like projections) to beat and sweep the respiratory tract clear of mucus, bacteria, viruses, dead cells, and other debris, and thus debris accumulates and triggers coughing and more mucus production (Carson-Dewitt 2006). Classic symptoms include spasms (paroxysms) of uncontrollable coughing, followed by sharp, high-pitched uptake of air, making the "whoop" sound that gave the disease its common name (Carson-Dewitt 2006). Pertussis was recognizably described as early as 1578 by Guillaume de Baillou (1538-1616), but earlier reports date back at least to the twelfth century (Versteegh et al. 2005). 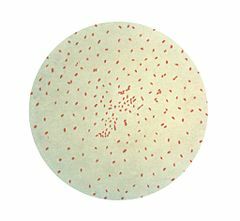 B. pertussis was isolated in pure culture in 1906 by Jules Bordet and Octave Gengou, who also developed the first serology and vaccine. The complete B. pertussis genome of 4,086,186 base pairs was sequenced in 2002. There is an effective pertussis vaccine that is typically given together with diphtheria and tetanus vaccine and called DTP, with a more recent formulation called DTaP when the three vaccines are combined. Although there is generally high coverage with the DTP and DTaP vaccines, the disease remains common. While particularly common in the developing world, it is estimated that 120,000 people in the United States get whooping cough each year (Rowland and Frey 2005). while children under the ages of two are at the greatest risk of both getting the disease and getting the serious complications (including death), individuals of any age that do not have immunity can get the disease (Rowland and Frey 2005). Exposure to the disease gives some, but not complete immunity to subsequent infections, but such repeat infections resemble the common cold (Rowland and Frey 2005). The vaccine, itself, is only about 70 percent effective with one shot and rises to 85 percent effective when given three times, as recommended (Rowland and Frey 2005). There are four primary stages of whooping cough, that partially overlap: incubation, catarrhal stage, paroxysmal stage, and convalescent stage (Rowland and Frey 2005). Catarrh (commonly known as a "runny nose") is a discharge or mucus blockage caused by the swelling of the mucous membranes. Adults and adolescents are the primary reservoir for pertussis. Pertussis is spread by contact with airborne discharges from the mucous membranes of infected people, who are most contagious during the catarrhal stage. The symptomless incubation period is typically 7 to 14 days after breathing the bacteria. After the incubation period, pertussis in infants and young children is characterized initially by mild respiratory infection symptoms such as cough, sneezing, and runny nose (catarrhal stage). After one to two weeks, the cough changes character, with paroxysms of coughing followed by an inspiratory "whooping" sound (paroxysmal stage). Coughing fits may be followed by vomiting due to the sheer violence of the fit. In severe cases, the vomiting induced by coughing fits can lead to malnutrition. The fits that do occur on their own can also be triggered by yawning, stretching, laughing, or yelling. The whooping sound is believed to be caused by inflammation and mucus narrowing the breathing tubes, causing the patient to struggle to get air into his or her lungs (Rowland and Frey 2005). The paroxysmal stage lasts two to four weeks and severely ill children may have great difficulty maintaining the normal level of oxygen and may also suffer from encephalopathy or seizures (Rowland and Frew 2005). Coughing fits gradually diminish over one to two months during the convalescent stage. Complications of the disease include pneumonia, encephalitis, pulmonary hypertension, and secondary bacterial superinfection (Matoo and Cherry 2005). Because neither vaccination nor infection confers long-term immunity, infection of adolescents and adults is also common (Hewlett and Edwards 2005). Most adults and adolescents who become infected with Bordetella pertussis have been vaccinated or infected years previously. When there is residual immunity from previous infection or immunization, symptoms may be milder, such as a prolonged cough without the other classic symptoms of pertussis. Nevertheless, infected adults and adolescents can transmit the bacteria to susceptible individuals. Adults and adolescent family members are the major source of transmission of the bacteria to unimmunized or partially immunized infants, who are at greatest risk of severe complications from pertussis. Because the symptoms during the catarrhal stage are nonspecific, pertussis is usually not diagnosed until the appearance of the characteristic cough of the paroxysmal stage. Methods used in laboratory diagnosis include culturing of nasopharyngeal swabs on Bordet-Gengou medium, polymerase chain reaction (PCR), immunofluorescence (DFA), and serological methods. The bacteria can be recovered from the patient only during the first three weeks of illness, rendering culturing and DFA useless after this period, although PCR may have some limited usefulness for an additional three weeks. For most adults and adolescents, who often do not seek medical care until several weeks into their illness, serology is often used to determine whether antibody against pertussis toxin or another component of B. pertussis is present at high levels in the blood of the patient. Basing diagnosis only on symptoms is not accurate since the catarrhal stage may appear to be an exceedingly heavy cold, or flu, or even bronchitis (Rowland and Frey 2005). Researchers believe that as many as 90 percent of the cases of whooping cough are not diagnosed, mainly due to the nonspecific symptoms displayed by adults (Rowland and Frey 2005). Treatment with an effective antibiotic (erythromycin or azithromycin) shortens the infectious period but does not generally alter the outcome of the disease. However, when treatment is initiated during the catarrhal stage, symptoms may be less severe. Three macrolides, erythromycin, azithromycin, and clarithromycin, are used in the United States for treatment of pertussis; trimethoprim-sulfamethoxazole is generally used when a macrolide is ineffective or is contraindicated. Close contacts who receive appropriate antibiotics (chemoprophylaxis) during the 7–21 day incubation period may be protected from developing symptomatic disease. Close contacts are defined as anyone coming into contact with the respiratory secretions of an infected person in the 21 days before or after the infected person's cough began. Infection with pertussis induces immunity, but not lasting protective immunity, and a second attack is possible (Miller et al. 2006) Efforts to develop an inactivated whole-cell pertussis vaccine began soon after B. pertussis was grown in pure culture in 1906. In the 1920s, Dr. Louis Sauer developed a vaccine for whooping cough at Evanston Hospital (Chicago, IL). In 1925, the Danish physician Thorvald Madsen was the first to test a whole-cell pertussis vaccine on a wide scale (Baker and Katz 2004). He used the vaccine to control outbreaks in the Faroe Islands in the North Sea. In 1942, the American scientist Pearl Kendrick combined the whole-cell pertussis vaccine with diphtheria and tetanus toxoids to generate the first DTP combination vaccine. To minimize the frequent side effects caused by the pertussis component of the vaccine, the Japanese scientist Yuji Sato developed an acellular pertussis vaccine consisting of purified haemagglutinins (HAs: filamentous HA and leucocytosis-promoting-factor HA), which are secreted by B. pertussis into the culture medium. Sato's acellular pertussis vaccine was used in Japan since the autumn of 1981 (Sato et al. 1984). Later versions of the acellular pertussis vaccine used in other countries consisted of additional defined components of B. pertussis and were often part of the DTaP combination vaccine. While DTP is composed of dead bacterial cells, the newer acellular pertussis vaccine (called DTaP when combined with diphtheria and tetanus vaccines) is made up of two to five chemical components of the B. pertussis bacteria (Rowland and Frey 2005). Pertussis vaccines are highly effective, strongly recommended, and save many infant lives every year. Though the protection they offer lasts only a few years, they are given so that immunity lasts through childhood, the time of greatest exposure and greatest risk (Versteegh et al. 2005). The immunizations are given in combination with tetanus and diphtheria immunizations, at ages 2, 4, and 6 months, and later at 15–18 months and 4–6 years and 11 years. The short term effectiveness of the vaccines, and the presence of B. pertussis infection in adults and adolescents who may transmit the bacteria to infants, have caused many in the medical field to call for booster immunizations at later ages. Although Canada, France, the United States, and Germany now have approved booster shots for adolescents, adults, or both, other countries adhere to the tradition of discontinuing pertussis vaccination after the age of seven, from concerns that there are side effects associated with the first available "whole-cell" pertussis immunizations that tended to increase with age. The whole-cell vaccine is still used in poor countries, since it is cheaper than the newer and safer acellular formulation. As the immunity from infection or vaccination lasts only a few years, the discontinuation of booster vaccination in older persons caused the emergence of a large pool of older persons lacking immunity, followed by an increase of adult-onset pertussis that accelerated beginning in about 2004 (Murphy 2005). This burgeoning outbreak is predicted to increasingly infect adults and adolescents with debilitating cases, but poses even more serious public health dangers to newborns. As adolescent and adult cases surge, newborns are again at risk of exposure to pertussis circulating in adolescents or adults in the community before the infants' vaccinations can be completed. The decision to resume vaccinating teens and adults reflects in part that the newer acellular vaccine, generally given as DTaP, has greatly reduced the incidence of adverse effects observed with the earlier "whole-cell" pertussis vaccine. An acellular vaccine preparation for adults and adolescents has been approved in Canada, Europe, and the United States. In the United States, the Food and Drug Administration has authorized both the use of the vaccines Boostrix (GlaxoSmithKline) for 10-18 year olds in May 2005 and Adacel (Sanofi Pasteur) for 11-64 year olds in August 2005 (FDA 2006). These vaccines are recommended for all teens and adults within the indicated age ranges, except for those with a history of adverse reaction to the whole-cell pertussis vaccines. The most serious side-effects of traditional "whole-cell" pertussis immunizations were neurological and included seizures and hypotonic episodes. Much of the controversy surrounding the DTP vaccine in the 1970s and 1980s related to the question of whether the whole-cell pertussis component caused permanent brain injury in rare cases. Although it was well-established that the pertussis component of the DTP vaccine accounted for most of the minor local and systemic side effects in many vaccinated infants, several published studies failed to show a causal relationship between administration of the DTP vaccine and permanent brain injury. However, criticism of these studies and well-publicized anecdotal reports of DTP-induced permanent disability and death gave rise to anti-DTP movements (Geier and Geier 2002). By the late 1970s, publicity about adverse reactions and deaths following pertussis vaccination caused the immunization rate to fall in several countries, including Great Britain, Sweden, and Japan. In many cases, a dramatic increase in the incidence of pertussis followed (Gangarosa et al. 1998). These developments led Yuji Sato to introduce a safer acellular version of the pertussis vaccine for Japan in 1981. Nevertheless, other countries continued to use the whole-cell DTP formulation. In the United States, low profit margins and an increase in vaccine-related lawsuits led many manufacturers to stop producing the DTP vaccine by the early 1980s. In 1982, the television documentary "DTP: Vaccine Roulette" depicted the lives of children whose severe disabilities were blamed on the DTP vaccine. The negative publicity generated by the documentary led to a tremendous increase in the number of lawsuits filed against vaccine manufacturers (Evans 2006). By 1985, manufacturers of vaccines had difficulty obtaining liability insurance. The price of the DTP vaccine skyrocketed, leading to shortages around the country. Only one manufacturer of the DPT vaccine remained in the United States by the end of 1985. To avert a vaccine crisis, Congress in 1986 passed the National Childhood Vaccine Injury Act (NCVIA), which established a federal no-fault system to compensate victims of injury caused by mandated vaccines (Smith 1988). Since then, the prices of vaccines have stabilized, and the number of lawsuits filed against DTP manufacturers has dwindled. The majority of claims that have been filed through the NCVIA have been related to injuries allegedly caused by the whole-cell DTP vaccine. The acellular pertussis vaccine was approved in the United States in 1992 for use in the combination DTaP vaccine. Research has shown the acellular vaccine to be safe, with few reports of adverse effects (URMC 2005). Although the whole-cell DTP vaccine is no longer used in the United States, it is still purchased by the World Health Organization and distributed to developing nations because of its much reduced cost compared to the acellular DTaP vaccine. Baker, J. P., and S. L. Katz. 2004. Childhood vaccine development: An overview. Pediatr. Res. 55(2): 347-356. PMID 14630981. Carson-DeWitt, R. 2006. Scarlet fever. In J. L. Longe, ed., The Gale Encyclopedia of Medicine. Detroit: Thomson Gale. ISBN 1414403682. Evans, G. 2006. Update on vaccine liability in the United States: Presentation at the National Vaccine Program Office Workshop on strengthening the supply of routinely recommended vaccines in the United States, 12 February 2002. Clin. Infect. Dis. 42(Suppl 3): S130-137. PMID 16447135. Food and Drug Administration (FDA). 2006. Tetanus toxoid, reduced diphtheria toxoid and acellular pertussis vaccine adsorbed, ADACEL, Aventis Pasteur Ltd. U.S. Food and Drug Administration. Retrieved December 9, 2007. Finger, H., and C. H. W. von Koenig. 1996. Clinical manifestations. In S. Barron et al., Barron's Medical Microbiology, 4th ed. Univ of Texas Medical Branch. ISBN 0963117211. Retrieved December 9, 2007. Gangarosa, E. J., A. M. Galazka, C. R. Wolfe, L. M. Phillips, R. E. Gangarosa, E. Miller, and R. T. Chen. 1998. Impact of anti-vaccine movements on pertussis control: The untold story. Lancet 351(9099): 356-361. PMID 9652634. Geier, D., and M. Geier. 2002. The true story of pertussis vaccination: A sordid legacy? Journal of the History of Medicine and Allied Sciences 57(3): 249-284. PMID 12211972. Hewlett, E. L., and K. M. Edwards. 2005. Pertussis—not just for kids. New Eng J Med 352(12): 1215-1222. Mattoo, S., and J. D. Cherry. 2005. Molecular pathogenesis, epidemiology, and clinical manifestations of respiratory infections due to Bordetella pertussis and other Bordetella subspecies. Clin Microbiol Rev 18(2): 326-382. PMID 15831828. Miller, M., S. Barrett, and D. A. Henderson 2006. Vaccine-preventable diseases. International Bank for Reconstruction and Development. Retrived December 9, 2007. Murphy, K. 2005. Enduring and painful, pertussis leaps back. New York Times February 22, 2005. Rowland, B., and R. J. Frey. 2005. Scarlet fever. In J. L. Longe, The Gale Encyclopedia of Alternative Medicine. Farmington Hills, Mich: Thomson/Gale. ISBN 0787693960. Sato, Y., M. Kimura, and H. Fukumi. 1984. Development of a pertussis component vaccine in Japan. Lancet 1(8369): 122-126. PMID 6140441. Smith, M. H. 1988. National Childhood Vaccine Injury Compensation Act. Pediatrics 82(2): 264-269. PMID 3399300. University of Rochester Medical Center (URMC). 2005. JAMA study finds whooping cough vaccine effective, safe for teens and adults. University of Rochester Medical Center News Archives June 3, 2005. Retrieved December 9, 2007. Versteegh, F. G. A., J. F. P. Schellekens, A. Fleer, and J. J. Roord. 2005. Pertussis: A concise historical review including diagnosis, incidence, clinical manifestations and the role of treatment and vaccination in management. Rev Med Microbiol 16(3): 79–89. Retrieved December 9, 2007. All links retrieved August 7, 2013. Pertussis at Todar's Online Textbook of Bacteriology. This page was last modified on 7 August 2013, at 16:03.